January 9, 2018 – It’s weeks away! 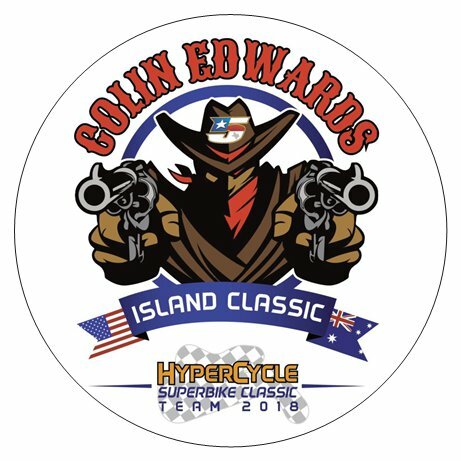 American MotoGP racer, Colin Edwards, aka “The Texas Tornado” will be participating for the first time in the Premier International Challenge race at the AMCN International Island Classic, Phillip Island, Australia on January 26-28th, 2018. The Texas Tornado has come out of race retirement, and is packing! He will be charging around the wicked fast Formula One track on a HyperCycle Superbike Classic Team special build. A replica chassis XR69 powered by a Yamaha FJ1200 engine built by Carry Andrew. 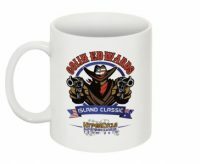 Edwards along with Andrew will be assisting TEAM USA in this iconic classic motorcycle racing event which marks it’s 25th silver anniversary this year. The three day event hosts 56 race classes with over 300 race bikes from years 1920-1990, the fastest being the Superbikes in the International Challenge. The Challenge is the premier race, which consists of four races over two days, with riders from Australia, England, New Zealand and the U.S. The five best cumulative score race results of the four races from each country are tallied, and the highest score wins the overall. The prizes…the Phil Irving perpetual trophy for best team, the Ken Wootton memorial trophy for best overall individual, the bragging rights, and a plate of brownies! We want those brownies!!! This is the fifth year of TEAM USA’s participation and stands to be the most historic. Edwards, 43, a Texan, with Australian roots, is a retired MotoGP racer, with 12 years of World level MotoGP racing experience (2003-2014). He is TEAM USA’s most experienced and fastest asset, and Phillip Island is the Texas Tornado’s favorite track! Joined by two other very fast American World level retired professionals, Jason Pridmore, 48, and Jame Zemke, 42 who have also come out of retirement to assist TEAM USA in the effort. This will be a debut for all three of our American “fast guys” to race classic Superbikes “Down Under”, and a test for all three as they will be without the electronic assists they had come accustomed to in their professional racing years. The Challenge race is truly a team effort, with each country to have as many as nine racers per team, and the competition is fierce, an international shoot out, the Aussies and Brits normally hire Isle of Man TT racers as their guns. The rest of TEAM USA competes in many of the other classes, comprised of primarily amateur classic racers, a few retired professionals, one with IOM TT race experience, Dave Roper. The arrival of our “fast guys” is much needed and will be a big boost for TEAM USA, four years without a podium in the premier race is too long! Help spread the word so we may see more American “fast guys and gals” and builders alike join the team! 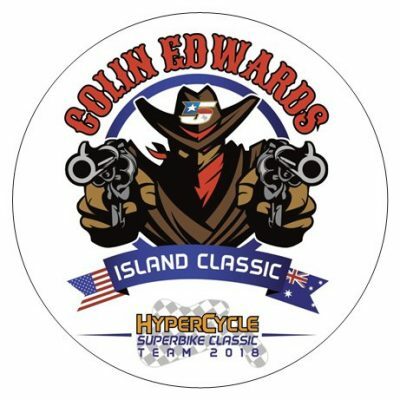 If you are a Colin Edwards fan, an enthusiast of classic motorcycle racing, a proud American, or all of the above, please show your support and sport a Texas Tornado Watch T-shirt, hat, mug or sticker!!! Available now in limited quantity, less than 200 shirts made! Contact if you have questions, info@helmetsnheels.com. Collaborative design credit: Shea Fouchek, Concept27, and Joldesigns! 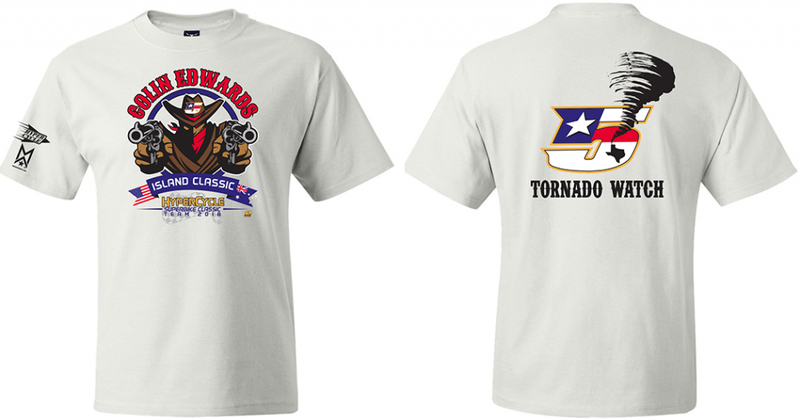 Colin “Texas Tornado” Edwards Island Classic 100% Cotton T-Shirts and stuff!!! 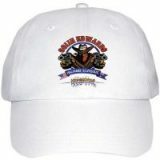 Please include address and add one freight charge for shipping per item ordered, to your order. U.S. Only!